Fish raising never existed before. People went out fishing in the natural lakes, creeks, canals, or rivers etc. The reason why female and male farmers decided to raise fish is that some lakes have become shallower and natural fish has become scarce, population grows. They have difficulty to fish in the nature. Because of these difficulties, women and men first began to raise very few ‘pra’ fish and ‘chdor’ fish. Later the natural fish production reduced gradually year by year, our women and men then continued to raise ‘chpin’, tilapia ‘kranh’, ‘andeng’… Nowadays, most fishes sold in the market are raised fish. Of those female and male fish raisers, some are able to sell and support their living from such sales and some others take it as their family career. Every fish raising by technic has not been disseminated to the citizens. Hygiene has not been paid attention to fish raising site, selection of fish race, drugs. That is why we do not succeed in fish raising. Thus, the agricultural development committee has prepared the document on fish raising to promote successful fish raising that sufficiently support the daily market supply. 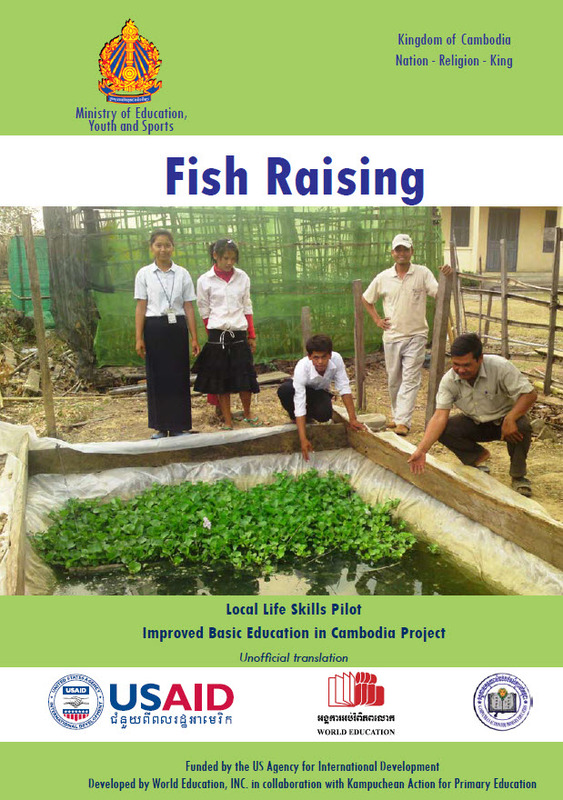 The document on “fish raising” aims to help male and female learners gain knowledge, skill, and experiences in simple life skills relating to the family job. Fish raising plays an important role in the production for some families. Learning about fish raising from the young age links the need with the priority and objectives that help adults avoid unemployment caused by the lack of knowledge in the agricultural production. We hope that youth at present can think, plan, and wish to raise fish including planning, budgeting, preparing materials according to the important stages so that this job will help develop their family in the future.